Riverside (1999) Football Club, who are sponsored by GreenPower, achieved a hard fought second place in the Scottish Central Division League Cup. They beat Alva in the semi finals at the Stenhousemuir Stadium and then went on to the final with Stenhousemuir on 17th June at Alloa Stadium where the game was decided on penalties. The following day they were then setting off from Liverpool airport to Barcelona to play in an international invitation football competition held just north of Barcelona involving teams from all over the world. The competition started with group stages over the first couple of days, followed by a trip to Barcelona’s ground and then the quarter, semi’s and final over the next two days. 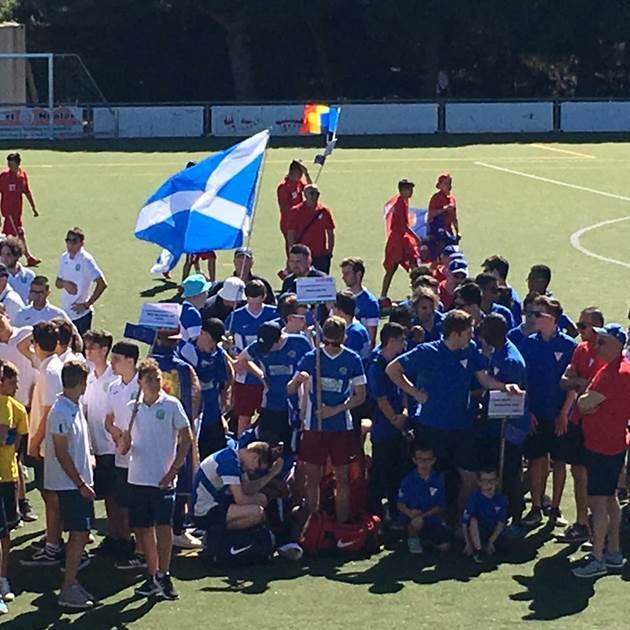 Representing Scotland, they quickly became firm favourites with the Spanish crowd wherever they played after being the only team to sing the national anthem at the top of their voices. They came third overall in the competition and received a large trophy and goal keeper Lewis was named goal keeper of the competition and also awarded a trophy. Such was their success that they have already been invited to play in competitions next year in Dubai and America. Riverside (1999) FC ready for their first game of the Barcelona Competition wearing the GreenPower sponsored kit.